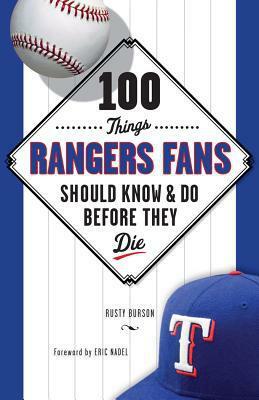 I was sent a few copies of the book “100 Things Rangers Fans Should Know & Do Before they Die”, and was asked to review them. Unfortunately, they sat on my desk, and got buried under some piles of miscellaneous crap, and I forgot about them. Well, today I’m rectifying that, as I wanted to write a quick review of the book. This book is not so much a fictional (or even non-fictional) narrative. It’s a collection of Rangers “moments” from all parts of the franchise’s history. At first, that might not seem like a fun “book”, but it’s quite a blast to read down the list. Obviously, the more recent events will be fresh in fans’ minds, but as you delve into the book, you’ll find many items in the lists that make you go either “Oh yeah!” or “I remember that!”. This book is a tour guide down the history that is the Texas Rangers franchise. It’s also a book that you can savor for awhile, you don’t need to blow through all 100 at once, or even in 2-3 settings. You can read one, digest it, and then get a totally different flavor when you come back for the next bite. That’s just a sample, as you can see, there’s items from every era of Texas Rangers baseball. There’s many more, the 10 cent beer night event, Jose Canseco pitching and a ball bonking off his head for a home run, several broadcasters, and subscribing to Jamey Newberg’s newsletter. The book definitely runs the gamut of Rangers history. By default, some of the early ones touch on the Senators years, but there’s no direct Senators entry. That’s OK, though – I’d say the overwhelming majority of Rangers fans can’t name anyone who was a Senators only player anyway. There’s a few other entries besides the “official” 100 in the title of the book. There’s a few side notes, smaller entries that aren’t numbered that are scattered through the book too, so there’s more than just one hundred. I really enjoyed wading through this blast down memory lane with the Texas Rangers. I didn’t see a Rangers game until 1993, and wasn’t really a fan until 1995, so a lot of the earlier memories are things I’m always looking for someone’s personal recollections of, as I didn’t live through them. This book touches on several of those, and I really enjoyed it for that. It’s not like a chronological listing of Rangers “events”, this is more personable than that. That’s a flavor I really enjoyed. I suggest buying a copy of the book if you’re a Rangers fan – I enjoyed the read. You can do this by clicking on the cover art above. Finally, I’m giving away two copies of the book through the generosity of the publisher. The first two Rangers fans responding to this review and email me will win. Just one condition. You have to be in the USA. I’m not going to ship outside of the USA. UPDATE: THESE HAVE ALL BEEN CLAIMED. Summary: Former high school ballplayer Brett Mandel yearned to experience a year in the minor leagues, so he convinced the Ogden (Utah) Raptors, about to embark on their maiden season, to let him chronicle that season from the perspective of a uniformed player. They agreed. The resulting saga describes the long bus rides, the bad food, the frustrations, and hopes that are all a part of baseball dreaming with affectionate good humor. The book’s true life, though, steps up in the poignancy with which Mandel draws his teammates, young men destined for the most part to fall short of their great desire. As a player, Mandel went 0 for 5 on the year, proving that the pen, long deemed mightier than the sword, can be mightier than the bat, as well. Joe’s Remarks: What a wonderful book! I picked this one up, and it stayed in my stack of books to read for about 6 months. That was a mistake – I should have read it first. This is a great book if you’re a fan of baseball, particularly if you’re a fan of minor league baseball. This tells the story of Brett’s year with the Ogden Raptors in 1994 from the start to the end of the season. Brett’s writing style is very easy to read. I tend to do most of my reading before going to bed at night, which usually means I can take several sessions to actually finish a book, as I did with this one. Most books suffer from when you pick them up again, it’s not that easy to jump right in where you left off. This one does not have that. For me, it lent itself great to reading it in chunks. Brett was on the Raptors for a whole year, and this book is his recollection of the travels, details, and behind the scenes things most people will never hear about. Check this out – this book has nothing to do with the Texas Rangers, but it’s a great GREAT baseball book! As an added bonus, I met the author in 1999 when Lynn & I went to Baltimore to see the Rangers play there. Brett and some friends were coming back from Cooperstown for the HOF induction ceremony, and were in Baltimore to see the Orioles play. He himself told me about the book, and we had a few moments talking about the Phillies, as we’re both from there. I wish I would have already read the book at this point, but Brett was a great guy to meet in person, too! Update Feb 2012: I haven’t read this book in many years, but the memories of it are strong, and the fact that we ran into the author randomly was also pretty fun. I still have the book, need to check it out again. As I said above, very enjoyable, even if it has nothing to do with the Rangers. You’re Out – And You’re Ugly, too! Summary: After decades of abuse and spittle, Major League umpire Durwood Merrill strikes back with some pretty incisive, funny, and no-holds-barred anecdotes. When his book stays in the game, it’s a real hoot, light and folksy; how can you not laugh with a guy who can admit that “Folks around the American League say I’ve sent a few pitchers to the Hall of Fame before their time because my strike zone tends to swell like George Steinbrenner’s ego”? It’s his own ego, though, that has him swinging for the seats and coming up short; he’s not much of a memoirist. Thankfully, like a good umpire, he keeps his personal interference to a minimum and mostly sticks to business, offering some tough prescriptions for what ails the game, and some solid dissection of the intricacies of his craft. His thoughts on Pete Rose might lead you to believe that Charlie Hustle is the book’s title character. Joe’s Remarks: When I first bought this book, I wasn’t quite sure what to think. I had heard a few negative things about it, and kind of had a prejudice against it. Boy, was that wrong! I found this to be a very funny, lighthearted read (for the most part). There’s some really wonderful insights into what it takes to become a big league umpire – never quite realized all they went through in “Umpire boot camp” (my term). It’s not all fun and games, there’s a few stories about how an umpire friend of his was attacked and crippled on the streets of Dallas, and the latter part talks a lot about his charity works. A great book – funny, light, and to be honest, something that surprised me in a very good way. What was personally annoying was that after I read this (during the last month of the 99 season), I wanted to watch Durwood, and then he up and retires during the playoffs. Damn. Really wanted to see him after reading his book. Oh well. Check it out, a good light read. Update Feb 2012: This book is too out of print, but used copies are pretty easy to come by. I cannot recommend this highly enough. Great read, I’m overdue to read it again. Enjoyed it an awful lot. Summary: Assigned to cover the Texas Rangers for the Fort Worth Star-Telegram in early 1973, gonzo sportswriter Mike Shropshire looked forward to the perks and padded expense account that went along with the job. He never dreamed he’d have to earn every penny–following arguably the worst team in baseball history. Full of wild games and wilder nights, and the exploits of some of the most extreme characters ever to play the game, this book is Shropshire’s irreverent, behind-the-scenes look at the hell a truly pitiful team can raise between games and innings. Joe’s Remarks: I wasn’t quite sure what to think of this one either. I bought it because of the tagline on the front about it being funny. I admit to not knowing a whole lot about the very early years of the Rangers (I didn’t move here until 1992, and didn’t really follow ’em until 1995), and the thought about reading a book all about them didn’t thrill me. However, I quickly found out that this was a hysterically funny book. Mike Shrophsire has a very funny wit, and isn’t afraid to let it fly when talking about the Rangers of this era. His recollection of events is awesome, and makes for very funny reading. If you’re a fan of the Rangers, or even if you’re not, GET THIS! It’s a very great read, although I don’t recommend it for very small kids, as there’s more than just one or two cuss words in there. Still, for adults, it’s well worth it. As of Mar 2000, it appears to be out of print (unfortunately) – but the link I provide by clicking on the cover will allow you to order it. If you can find it on a bookstore shelf, get it now while you still can. Update Feb 2012: The book is still out of print, but you can buy used copies. I strongly urge you to. It’s a warts and all, and rather funny look back at the earliest seasons of Texas Rangers baseball here in the Metroplex. Summary: Nolan Ryan: From Alvin to Cooperstown is a collection of articles and rare photographs from the archives of The Sporting News. With Ryan’s 1999 induction into the National Baseball Hall of Fame, this book is the first to capture his entire career in pictures with the New York Mets (’66-’70), California Angels (’71-’79), Houston Astros (’80-’88), and Texas Rangers (’89-’93). Baseball’s all-time strikeout leader and the author of seven no-hitters, Nolan Ryan is in many ways the most remarkable pitcher to ever play the game. Joe’s Remarks: I got a kick out of this book. Has a ton of pictures of Nolan through his career, and covers virtually every aspect of his career. I was fortunate enough to see him pitch one time in Texas (his final Texas appearance), as I hadn’t moved here till December of 1992. If you’re a fan of Nolan Ryan, then you should probably pick this up. It’s not the heaviest read ever put together, but it’s a nice tribute to Nolan’s career. Synopsis: With 300 photos, many in color, a host of interviews, and pertinent statistical matter, this resistible keepsake for any Rangers fan brings readers all the glory of the 1996 season and covers all the drama and color of the 24 seasons that preceded it. Joe’s Remarks: I loved this book. My wife gave it to me as a a present in 1997, and it was wonderful! I can’t recommend this book enough. I’ve only been a Texas Rangers fan since 1994, and my wife gave me this book as a present in 1997. I knew the Texas Rangers existed before I came to live in the Dallas/Ft. Worth Texas area, but I never thought much of them. I didn’t realize the characters and history of the team. If you’re a casual Rangers fan, or a die hard Rangers fan, then you should have this book. It’s filled with all kinds of informational pieces about the team’s history, going back to the early 70’s when they were the Washington Senators. Focuses heavily on the 1996 season in which they finally made it to the playoffs after about 25 years. As the Texas Rangers now move into the Alex Rodriguez era, the book probably could stand an update, as a lot has happened since the book was published during the 1997 season, but it’s a great read if you’re into team history. Feb 2012 Remark: I wrote this back in 1997 not too long after my then one year wife gave me this. The book now in Feb 2012 is out of print, and expensive. Eric has told me a few times the only thing that would make him do a sequel is if the Rangers got the World Series. I reminded him of that after the 2010 season, and he said that he doesn’t have the time now, he’d probably farm it out to someone when they win.